In June 2008 more than two thousand wildfires, all started by a single lightning storm, blazed across the state of California. Tassajara, the oldest Zen Buddhist monastery in the United States, was at particular risk. Set deep in the Ventana wilderness north of Big Sur, the center is connected to the outside world by a single unpaved road. If fire entered the canyon, there would be no way out. Disaster struck during the summer months, when Tassajara opens its doors to visitors, and the grounds fill with guests expecting a restful respite. Instead, the mountain air filled with smoke, and monks broke from regular meditation to conduct fire drills. All visitors were evacuated, and many Zen students followed. A small crew of residents and firefighters remained, preparing to defend Tassajara. But nothing could have prepared them for what came next. When a treacherous shift in weather conditions brought danger nearer still, firefighters made the flash decision to completely evacuate the monastery. As the firefighters and remaining residents caravanned out the long road to Tassajara, five monks turned back, risking their lives to save the monastery. Fire Monks is their story. A gripping narrative as well as an insider’s portrait of the Zen path, Fire Monks reveals what it means to meet an emergency with presence of mind. In tracking the four men and one woman who returned—all novices in fire but experts in readiness—we witness them take their unique experiences facing the fires in their own lives and apply that wisdom to the crisis at hand. Relying on their Zen training, the monks accomplished the seemingly impossible—greeting the fire not as an enemy to defeat, but as a friend to guide. Fire Monks pivots on the kind of moment some seek and some run from, when life and death hang in simultaneous view. Drawing on the strength of community, the practice of paying attention, and the power of an open, flexible mind, the Tassajara monks were able to remain in the moment and act with startling speed and clarity. In studying an event marked by great danger and uncertainty, Fire Monks reveals the bravery that lives within every heart. Colleen Morton Busch’s nonfiction, poetry, and fiction have appeared in a wide range of publications, from literary magazines to the San Francisco Chronicle, Tricycle, and Yoga Journal, where she was a senior editor. A Zen student since 2000, Busch lives in Northern California with her husband and two cats. "Vivid prose as electrifying as any beach novel you're likely to find this summer." "This day-by-day account of the defense of Tassajara Zen Mountain Center against massive wildfires in summer 2008 brings a Buddhist twist to the age-old preoccupation of humans living with--and trying to control--fire." 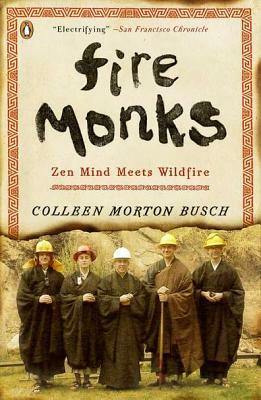 "An absorbing account of how two priesthoods -- professional wildland firefighters and Zen monastics -- confronted the fire's threat." "This book reads like a hair-raising adventure novel." "Fire Monks demonstrates the clarity of thought and action that can spring from Zen practice."